Once again, Emma and I made a brief stop-off at a new and exciting location. On this occasion while making the big trip from NZ to the UK, we touched down in Kathmandu, Nepal. Although we met numerous kind and welcoming people, tried an array of scrummy food items, and visited many sacred and historic sites as we could, we still felt the need to meet some of the other (somewhat furry) locals. 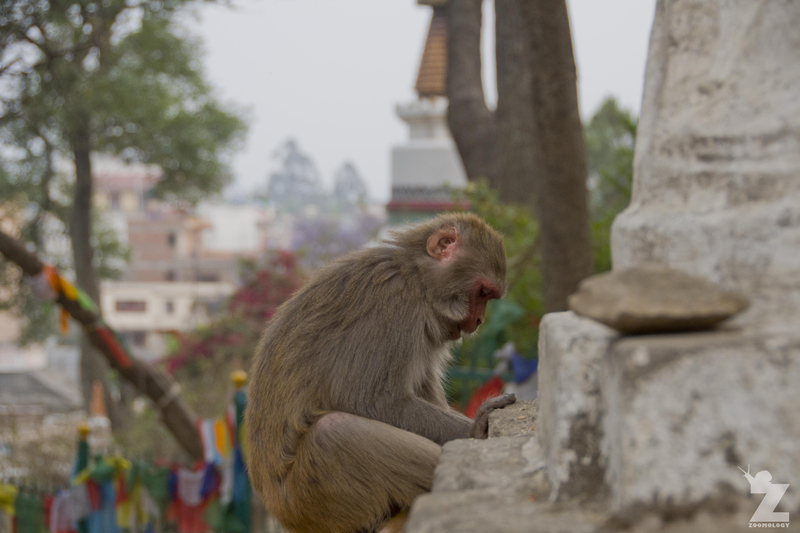 For this experience we headed out with a old friend of Emma’s and some new Nepali friends to the top of Swayambhunath. This is an ancient stupa (a dome-shaped building erected as a Buddhist shrine) atop a hill in the Kathmandu Valley, west of Kathmandu city. 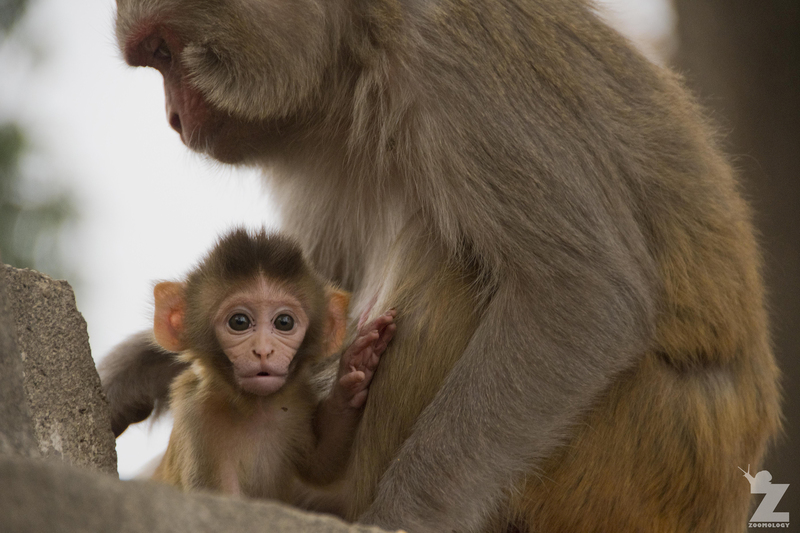 Not long after climbing the first set of steps, a macaque took a sudden disliking to a group of teenagers. This interaction highlights one of the issues that arise when people live in close quarters with and have historically fed the wildlife. These monkeys are very intelligent, seemingly knowing which individuals to harass in the hopes they will drop food. 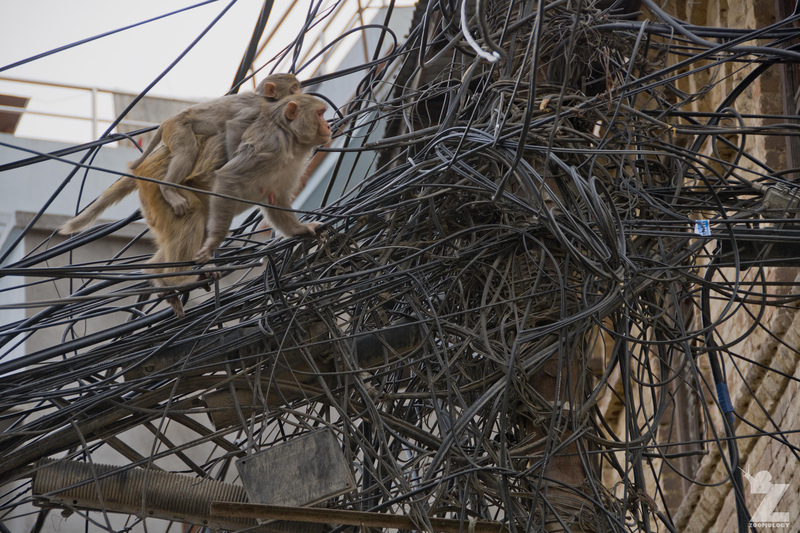 With the surrounding trees protected by religious beliefs the monkeys have found a little island amongst a sea of overloaded dusty streets and colourful towering buildings. We also witnessed the macaques eating scraps and playing with rubbish. 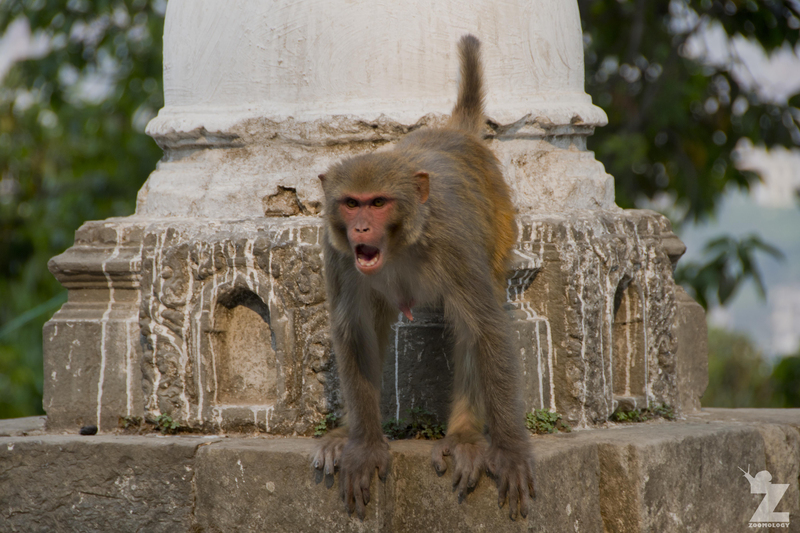 Dr Mukesh Kumar Chalise, an associate professor of Zoology at Tribhuvan University, has been following these monkeys since 1991 and has found that their numbers remain between 425-450 individuals at Swayambhunath. He also explains that their high numbers for such a small 2.5 hectares site (which under normal conditions would only support 40-50 individuals) is due to human food scraps. He warns of the perils of ‘wildlife provisioning’, the “offering of food to a non-human animal, beyond its natural supply and the quality of the animal’s environment.” If you would like to know more about these issues you can read more here and here. 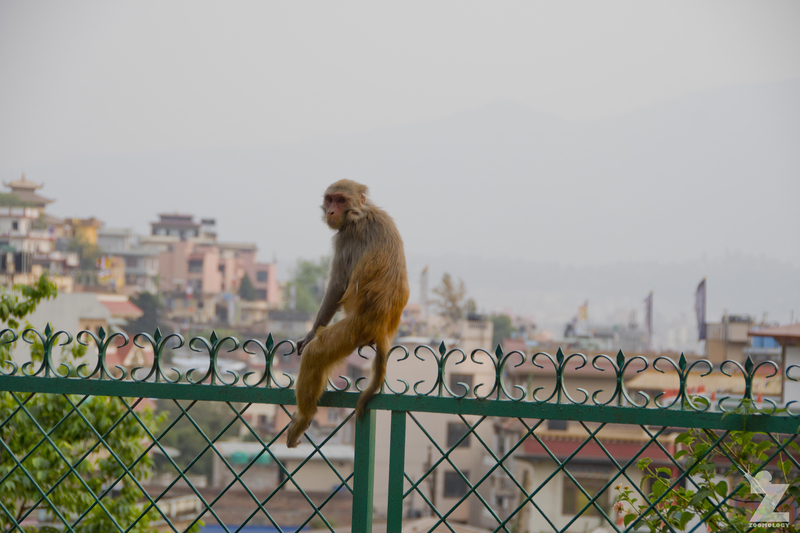 Watching these urbanised monkeys going about their daily lives atop the hill and on and around the temple was quite a fascinating experience. For both Emma and I, our take home feeling was how seemingly well they have adapted to an ever increasingly unusual environment. They navigated the electrical wires, fences and buildings no differently than their ancestors would have on the vines, branches and trees that would have historically been in the area. Just before heading off the hill, we noticed one very obliging female macaque. After taking her photograph she looked down. That’s when we realised she was hiding something. Now, look at that face. Totally beyond cute. Beautiful tenderness in the mama and baby photos, they’re really special photos! Haha, I completely understand! 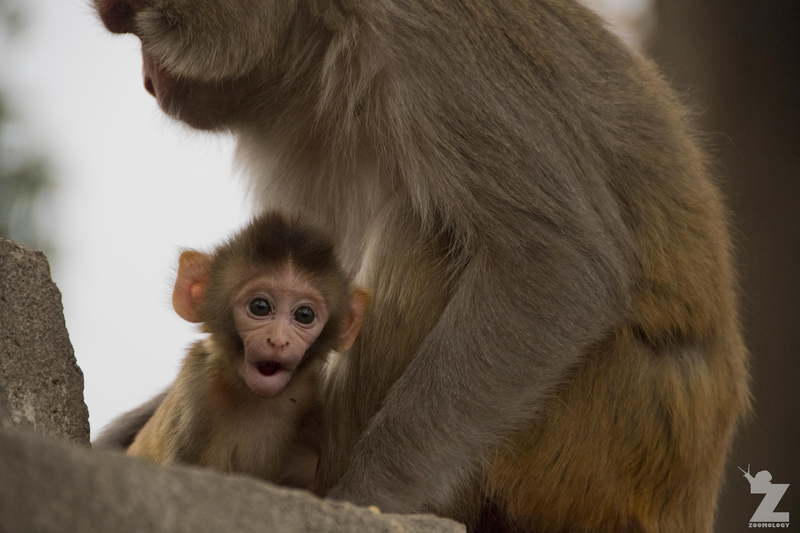 Our Nepali friends were also vary wary of the macaques and their bold behaviour. 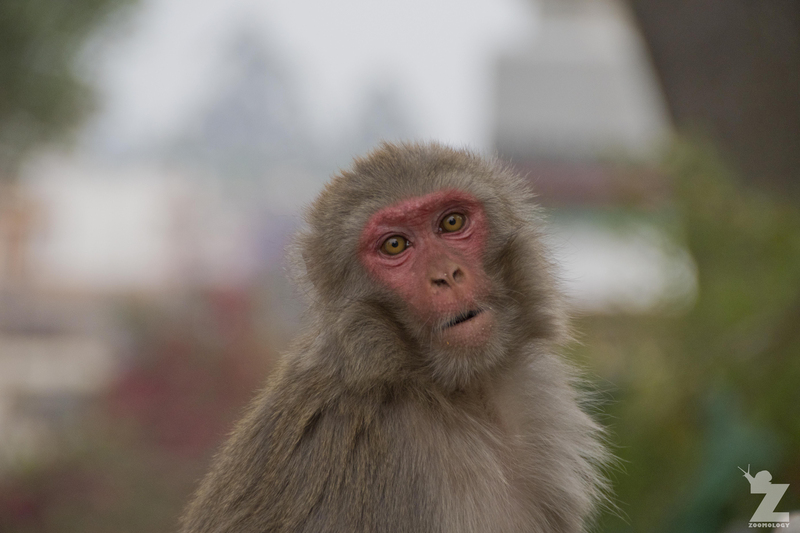 I remember having my bag ripped out of my hands by a macaque when I was living in Japan. It dropped it in the bushes about 50m away when it realised there was no food inside! I love the photo of the one with the mother and baby where the mum has a very shifty expression. 😄 I recently spent time with baboons in close proximity at a zoo and was quite shocked by how scary they are up close (even with a barrier in between) so I can imagine these guys being quite something if they want your food. I love that photo, too. So much sass! Yes, you definitely wouldn’t want to get on the wrong side of most primates when they decide they want your dinner 🤣. How awesome that you have spent time with baboons! What was it that you were doing? I’m currently doing a zookeeping course so have been getting up close and personal with quite a few of the residents. Great fun. I find the the image with the electrical wires quite touching.. And telling much about us in general, at that. Thanks for your comment, Kutukamus. We really like that set of images also. They tell such a story! 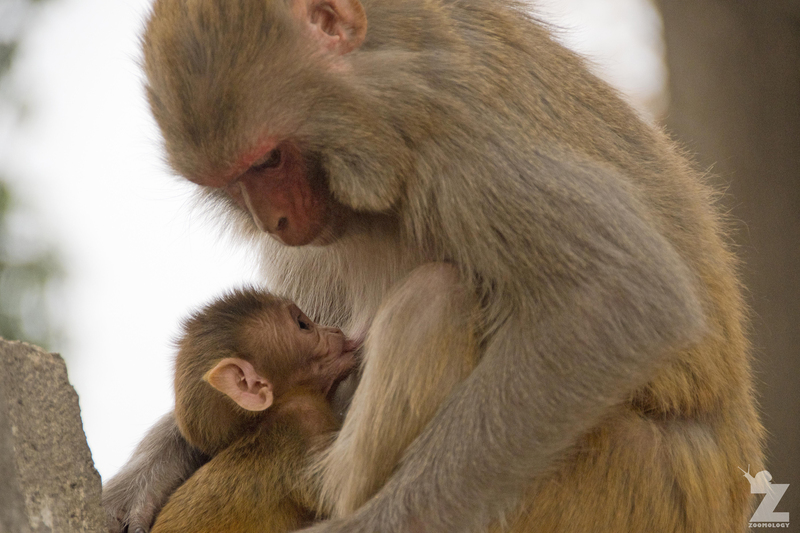 Although it is lovely that these monkeys are not reviled, it is, however, tragic that habituating them and feeding them has such unintentionally disastrous effects on the social structure and health of the monkeys. (Thanks for the links.) And ultimately, humanized monkeys end up being reviled by so many people, when it is not the fault of the monkeys that they have adapted to what is on offer in the face of decreasing natural habitats. Your photos are so interesting, and of course the mother and the baby are totally beguiling. Yes, we absolutely agree. Thank you for another insightful comment, Carol!